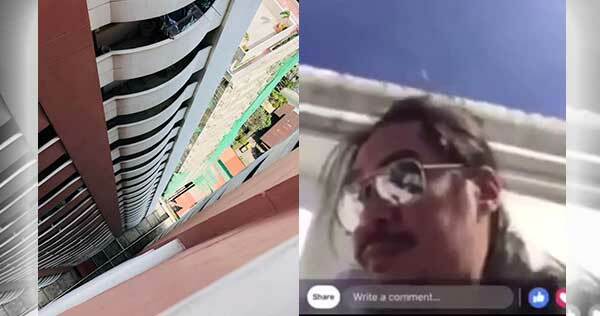 Netizens were shocked when a Facebook video showing Razorback drummer Brian Velasco falling off a condo went viral on Wednesday, January 16. Reports said the OPM rock artist took his own life by jumping down from the rooftop of the Vito Cruz Towers in Malate, Manila. Since 1990, the late drummer was part of Razorback, one of the longest-running Pinoy rock and roll bands. The video, first seen on Velasco's account via Facebook live streaming, was copied by some social media users and uploaded it on other sites among which is YouTube. "May I request my friends here on facebook who might come across my cousin Brian Velasco's last video post, to politely ask people who are sharing it (if you know them personally) and persuade them to refrain from doing so and to pull it down from their newsfeeds? It is too painful for family and friends to see such a tragedy appear on our feeds, especially for those who's lives he touched. There are many better and more beautiful things to remember Brian by, memories of him that we would rather keep alive to bring a smile to our hearts in this dark time. We urge you to kindly offer him a prayer for his eternal rest instead. Thank you." After several hours, the video sharing site removed it for violating its community guidelines. Facebook followed suit later. The reason that led to Brian Velasco's tragic death, whether he was depressed or has unbearable problems, is yet to be known.